This article is about the train operating company operated by Serco and Abellio between 2004 and March 2016. For the new Northern franchise operator, see Northern (train operating company). Northern Rail (also known as Northern)  was an English train operating company owned by Serco-Abellio. It was the primary train operator in Northern England, and operated the most stations of any train operating company in the UK. Northern Rail also operated the Northern Electrics sub-brand on electrified services in North West England using class 319 units from Thameslink. Northern Rail (Northern) was replaced on 1 April 2016 by Arriva Rail North's Northern brand. 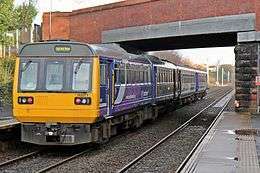 Northern Rail operated a total of 102 Pacer trains, more than any other train operator in Britain. These were built on a low budget during the 1980s recession and the upper body is based on a Leyland National bus. Many passengers were unhappy with the ride quality of these trains, noting that they provide an uncomfortable ride, were very noisy when going around bends, and were far too small for the current passengers numbers travelling at peak-time. One politician has even said they were not safe, but this was strongly denied by the company and the government. High fares in non-PTE areas adds to criticism about what some called life-expired trains being used. Northern Rail had a reputation for its rather tough approach on fare evasion, and was known to take passengers to court for underpaying by a matter of pence even where the company has no concrete proof. Northern Rail tried to prosecute one passenger who they claimed had tried to avoid paying part of his fare but the court case failed, costing Northern over £2,000 in legal fees. The court case was believed to have failed as Northern required some passengers to carry special tickets saying which station they boarded at and tried to use that as evidence of attempting to combat fare evasion by not having passengers paying for shorter journeys than they make. 1 2 "About Northern: Facts and Figures". Retrieved 14 March 2016. ↑ "Abellio Group Head Office" Group corporate website, Abellio, Utrecht, Netherlands, Undate. Retrieved 19 June 2015. ↑ "Northern franchise awarded to Arriva" (Press release). Arriva. 9 December 2015. Retrieved 10 December 2015. ↑ "The Trans-Pennine Express rail franchise" (PDF). Yorkshire & The Humber Transport Activist's Roundtable Briefing Note. October 2001. Archived from the original (PDF) on 20 October 2004. ↑ "Serco-NedRailways Announced as Preferred Bidder for new Northern Rail Franchise" (PDF) (Press release). Strategic Rail Authority. 1 July 2004. Archived from the original (PDF) on 25 August 2009. Retrieved 23 June 2009. ↑ "Rail Report No.62" (PDF). Mid Cheshire Rail Users Association. Christmas 2004. Archived from the original (PDF) on 27 March 2009. Retrieved 23 June 2009. ↑ "Serco/NED Rail is poised to secure Northern franchise". Rail (492). Peterborough. 21 July 2004. p. 14. ↑ "Rail Report No.61" (PDF). Mid Cheshire Rail Users Association. Autumn 2004. Archived from the original (PDF) on 27 March 2009. 1 2 "Northern Secures Two Year Franchise Extension" (Press release). Northern Rail. 13 May 2010. Retrieved 6 September 2010. ↑ "Stock Exchange Announcement" (PDF). Serco. 13 May 2010. Retrieved 27 November 2015. 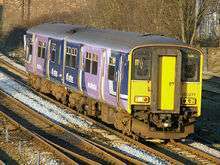 ↑ "Northern Rail granted franchise continuation". Rail.co. 10 May 2012. Retrieved 10 May 2012. ↑ "Franchise Continuation for Northern Rail" (Press release). Northern Rail. 9 May 2012. ↑ "Contract News Update 14" (PDF) (Press release). Serco. 14 May 2012. ↑ "Railway plan puts new focus on passengers". Secretary of State for Transport statement 26 March 2013. ↑ "Shortlist for Northern and TransPennine operators revealed" (Press release). Department for Transport. 19 August 2014. ↑ "Massive boost to rail services brings Northern Powerhouse to life" (Press release). Department for Transport. 9 December 2015. Retrieved 9 December 2015. ↑ "Northern and TransPennine Express franchises awarded". Railway Gazette International. London. 9 December 2015. ↑ "Extra Leeds Nottingham Train Services Announced" (Press release). Northern Rail. 22 November 2006. ↑ "Northern Introduces New Nottingham-Leeds Service" (Press release). Northern Rail. 12 December 2008. ↑ "Celebrate The Curve As East Lancashire To Manchester Services Return" (Press release). Northern Rail. 14 May 2015. Retrieved 15 May 2015. ↑ "Todmorden Curve". Northern Rail. Retrieved 15 May 2015. ↑ "Oldham Loop rail line closure" (PDF). GMPTE information poster. Greater Manchester Passenger Transport Executive. September 2009. Archived from the original (PDF) on 6 July 2012. Retrieved 5 October 2009. ↑ "Northern Rail Wins Public Transport Operator of the Year" (Press release). Northern Rail. 16 August 2007. Retrieved 31 May 2008. The judges praised the company, which runs local and regional trains across the north of England, for its success in attracting 20% more passengers since it started in 2004. ↑ Performance figures, Northern Rail. ↑ "New Northern Rail Franchise Signed" (PDF) (Press release). Strategic Rail Authority. 19 October 2004. Archived from the original (PDF) on 25 August 2009. Retrieved 22 December 2008. ↑ "Rail performance results period 7". Network Rail. Retrieved 20 December 2013. ↑ "158 Reshuffle Boosts Fleet". Rail Magazine. No. 551. 25 October 2006. p. 55. ↑ "30 Class 158's Bound for Northern by the End of 2007". Rail Magazine. No. 562. 28 March 2007. p. 17. ↑ "December Timetable Triggers DMU Cascade". Rail Magazine. No. 580. 5 December 2007. p. 12. ↑ "Train Operator's Fluctuating Fleets". Rail Magazine. No. 583. 16 January 2008. p. 45. ↑ "Third Adelante for Northern". Rail Magazine. No. 606. 3 December 2008. p. 69. ↑ "Better Rail Services Between Liverpool Lime Street and Manchester Airport" (Press release). Northern Rail. 5 March 2015. 1 2 "Northern launches first regular direct service between Nottingham and Leeds for 25 years" (Press release). Northern Rail. 15 December 2008. Archived from the original on 27 July 2011. ↑ "Yorkshire and Humber Route Utilisation Strategy Draft" (PDF). Network Rail. Retrieved 23 June 2009. ↑ "The Northern Interim Franchise Agreement" (PDF). UK Government. 26 March 2014. Retrieved 27 November 2015. ↑ "Better Rail Stations – Part B" (PDF). Department for Transport. 2009. Archived from the original (PDF) on 14 September 2014. ↑ "Pacer line users - RailUK Forums". Railforums.co.uk. Retrieved 19 September 2011. ↑ "Pacer's or Roof??? - RailUK Forums". Railforums.co.uk. Retrieved 19 September 2011. ↑ "MP says trains in area are 'unsafe'". Lancashire Evening Post. Preston. 17 February 2009. Retrieved 19 September 2011. ↑ Siddle, John (2 January 2009). "Northern Rail, which runs the Southport to Manchester line, told to improve its services after announcing ticket price hikes". Southport Visiter. Retrieved 19 September 2011. ↑ "Law student gets £1,000 bill". Yorkshire Post. Leeds. 9 March 2006. Retrieved 19 September 2011. 1 2 Linton, Deborah (27 May 2011). "Commuter finally cleared over 50p train fare fraud after 11-month legal battle costing thousands". Manchester Evening News. Retrieved 19 September 2011.